Designed for superior thermal performance in harsh industrial environments, OMEGA’s new SSRDIN/SSR3PH relay is the most advanced DIN rail solid state relay in its range. The epoxy-free design eliminates stress on internal components, preventing damage to the encapsulant during load failure. The vertical placement of the directbond substrate allows the SCR die to efficiently transfer heat to the heat sink and into ambient air. As a result, these relays can operate at a lower temperature than their competitors, which accounts for the higher I2T and surge-current ratings. The SSRDIN’s internal transient protection is fully repeatable, making MOVs or other external suppressors unnecessary. This feature allows the output to conduct load-current when a transient is detected across the output terminals, rather than forcing load-current through the protection circuit. Thus, no degradation of protection occurs. 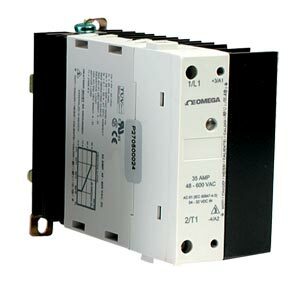 These relays are ideal for numerous commercial and industrial applications, including mercury relay replacement, professional food-service equipment (ovens, fryers, dispensing equipment, conveyors, etc. ), sterilizers, temperature control systems, plastic extrusion/thermoforming machinery, HVAC and R, kilns, packaging equipment, sorting equipment, wave solder and reflow systems, lighting systems, pump controls, incubators, motor-switching, and UPS systems. * For 108 to 280 Vac input.